If you'd like to follow periodic updates from the event, head on over to my feed on Twitter, where I'll be posting news throughout the day. If you're already on twitter, you can follow me @drdebs (how's that for creative?) Don't worry--there won't be a string of notes all day. 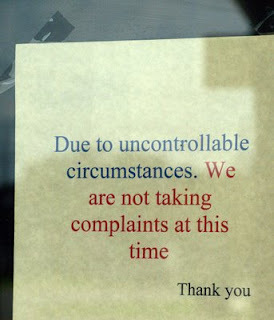 I can't multitask that well! Instead, I'll take a break now and again to give you some of the highlights. Expect more fulsome coverage in the days and weeks to come. Meanwhile I hope you'll all enjoy these sips of Hospice du Rhone. Welcome to the wrap up for the April edition of the Wine Book Club--this month known as Kori and Deb's Wine Club. We were the only two to crack the covers of Jamie Goode's The Science of Wine: From Vine to Glass. If I somehow missed your post please let me know. Both Kori of the Wine Peeps blog and I had the same reactions to this book. First off, we both applauded the author for his remarkable clarity. If you want someone to explain (as clearly and comprehensively as possible) everything from the science of cork taint to the reasons why oak influences the taste of wine, this is your book. My favorite parts were about pruning and trellising--perhaps because as an amateur gardener I really enjoyed the discussion of exactly how vines are trained. Kori was interested in the discussions of terroir, of climate change, and sulphur dioxide. If you are a science buff, you will also probably enjoy this book, because it really does talk about wine from a scientific standpoint and in so doing, explores just what can be scientifically verified when it comes to wine taste and what can't (or can't yet, like biodynamics). But it's not for everybody. Readers with little scientific background may find, like me, that this is one for the reference shelves. As Kori put it, this was "not the easiest read." Kori cautioned the book was "way too complex for beginners or people who don’t really care about some of the factors that affect the taste and quality of wine," but did recommend it to people " in the wine business or studying for a wine certification." Next month we will be reading Sergio Esposito's Passion on the Vine: A Memoir of Food, Wine, and Family in the Heart of Italy. I'll have more information on the book on Tuesday, and hope that more of you will join us as we go traveling this summer. We had a heat wave in LA recently, with temperatures well into the 90s. It was a not-so-gentle reminder of the high temperatures to come. Do you have your summer whites on hand for the first time the mercury climbs into the stratosphere? 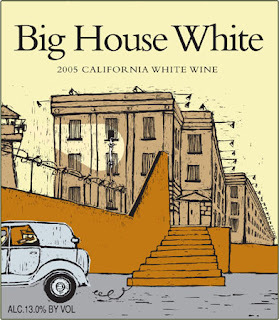 If not, consider picking up the 2007 Big House Wine Company Big House White. (suggested retail $9.99; available for $7-$12 throughout the country) It's a blend of Muscat Canelli, Viognier, Sauvignon Blanc, Malvasia Bianca, Vermentino, and Muscat de Gaillo. And while some wines blended from this many grapes can be a bit mushy in the taste department and leave you wondering why they bothered to mix them all together, this blend works to produce a white wine that is perfect for chilling down and sipping on the patio while you grill up some fish or chicken. This may be the quintessential summer sipper with its aromas of peach, apricot, and blood orange lurking under a Stelvin closure. Flavors of blood orange and peach predominate, all wrapped up in a sweet and honeyed aftertaste. Even so, there's enough acidity to keep the wine lively and interesting. Excellent QPR given the wine's price and its well-balanced flavors. This wine would be just as at home with spicy Asian food as it would be with grilled food, and it's a perfect partner for salads, too. We had ours with the cover recipe from a recent issue of Bon Appetit: a salad of grilled chicken, radish, cucumber, and tarragon pesto. I often pair tarragon with Sauvignon Blanc, but if you don't get it just right the tastes can sometimes be jarring. This wine was great with the strong flavors of the radish and tarragon, and had the right blend of softness and acidity to pair with the cucumbers and greens. Full Disclosure: I received this wine as a sample. This month's Italian wine focus was on Puglia, the heel of the Italian peninsula's boot. The best known Puglian red grape variety is Primitivo, a grape that has a close relationship to Zinfandel. 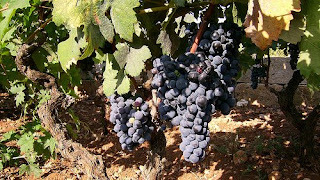 Both Primitivo and Zinfandel are descended from a common ancestor: the Croatian grape Crljenak. Zinfandel is identical to Crljenak, while Primitivo is a clone of Crljenak. You can find more information about the mysterious identity of Zinfandel and the genetic decoding of it by clicking here. I used to drink a lot of Zin, but in recent years I've found them overwhelming and difficult to pair with food. So I was intrigued to see what an Italian Primitivo would be like. The 2007 Petraio Primitivo was proof that you can make a wine with this group of grapes that comes in at around 13% alc/vol--and that it's a good thing when it does. There were faint raspberry and chalk aromas that were restrained and opened up slowly with air. These were followed by crisp blackberry fruit, some spice, and a nice acidity at the core that will make it a great pair for pasta with red sauce or pizza. Best of all is the price. With a suggested retail of $8.50, this wine is guaranteed to please for a budget price and represents very good QPR. This is a new vintage, but expect to see it soon at stores such as Specs (where you can find the 2005 vintage). For more information on when and where it might become available near you, contact the importer, The Marchetti Company. 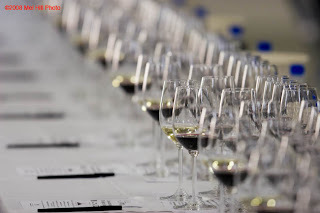 Next weekend I'm off to the 17th annual Hospice du Rhône tasting, an event held in Paso Robles to celebrate Rhône varieties and the winemakers who use them to create world-class wines. I am something of a Syrah maniac (a tendency I try to keep under control here on the blog) and love Viognier, too, so I'm really looking forward to tasting and learning about these wines. To get in training for the event, I participated in the Hospice du RhôneTwitter Taste Live last Friday. (I can't seem to locate any feed of the tasting notes, but you can read east coast co-host 1 Wine Dude's report here.) From Europe through several time zones to the west coast, this provided an opportunity to taste a number of wines that were made with Rhône varieties from all over the world. I focused on wines from Australia and the US, and made a particular effort to get a sense of the differences between the wines made in US regions. Here are my favorites from the tasting, and some initial observations. I'll have a lot more to say about the Rhône in a little over week, so stay tuned. Full Disclosure: I received the Anaba and Substance wines as samples. It's hot in LA. Really, really hot--as in record breaking. When it's this hot, you want a wine that's bright and refreshing. I'm learning about the wines of Alsace these days, and this is the first of several recommendations to come. If you don't know about Alsatian wines, I can assure you that they are perfect spring-into-summer picks with vibrant acidity and a kind of nervy, racy quality that keeps the wine lively and bright down to the last drop. 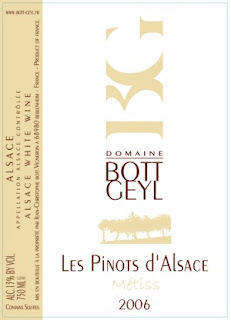 If you are looking for a starting place for Alsatian whites try this 2006 Bott-Geyl Les Pinots d'Alsace Metiss. ($16.00, Domaine547) This was a lovely wine for the price with nice depth and a briskness that kept it lively. It's made from a blend of four different Pinot grapes--Pinot Auxerrois (33%), Pinot Blanc (33%), Pinot Gris (17%), and even some Pinot Noir (17%). This is not a rose wine, though--this is white. There were lovely honeyed orange and lemon aromas and flavors, and a nice stoniness in the aftertaste. Excellent QPR. This wine would be terrific with grilled chicken or fish--the kind of hot weather foods we'll all be eating soon--but it has the necessary stuffing to stand up to grilled sausages or pork, too. I hope to have a blog post up later today, but it may not happen until tomorrow. I appreciate you hanging in there while the dust settles. Things will be back to normal soon. Friday Nights IN is a regular feature at GWU$20 that's intended to trim a few dollars from your entertaining budget by replacing a meal out with a meal in. Some suggestions are dinners for four, six, eight, or even ten. Some are for romantic dinners for two. And some suggestions are perfect for when you need time to yourself! Today's Friday Nights IN suggestion is for a comforting dinner for 1-4 people that is perfect for recovering from filing your taxes. This meal manages to be comforting, frugal, and just a tad bit glamorous. Yes, it's a chi-chi take on grilled cheese--but who do you know that doesn't like grilled cheese? Rent a movie, invite some friends over, and pour some good wine. You can all recover together. If you're too glum to see friends given the news you received yesterday from your accountant, make yourself two sandwiches and eat both of them. The Food: Grilled cheese may not scream glamour to you, but I love toasted cheese sandwiches and eat them whenever I have the excuse. If you must, you can call it a panini and feel more hip. But I warn you, this smoked salmon panini is not your ordinary grilled cheese. It uses Brioche (although I used Challah, as I couldn't find Brioche), Dijon mustard, smoked salmon, Gruyere cheese, and the vital secret ingredient of fresh lemon zest. Slap all that in a fry pan or between the plates of a panini grill and you're on the way to a perfect meal if you have a bag of lettuce leaves and some dressing to serve alongside. The Wine: I love an oaked Sauvignon Blanc with smoked fish like the salmon in this grilled cheese. In the United States, such bottlings are often labeled "Fume Blanc," a name coined decades ago by Robert Mondavi to help his wine compete better in the marketplace with French labels. (check out a history of the term here) In honor of Mr. Mondavi, I opened up a bottle of the 2007 Robert Mondavi Fume Blanc from the Napa Valley (available for $12-$20). This is one classy wine, with fresh Sauvignon Blanc fruit that's been barrel-aged for richness. Expect to smell creamy citrus and melon, along with some tarragon and herbal notes when you open up the bottle. These will be followed by citrus and orchard fruit flavors that are held in nice balance with the subtle oak which lends depth and complexity. Excellent QPR. Everybody likes to have a house wine at the ready. You know, one of those wines that go with everything and please most people's tastebuds. If you're on the lookout for a new house white, why not try one from Washington? As regular readers know, I'm trying to learn more about the wines from this part of the world, and to do so I picked up this bottle from Washington's Columbia Valley. 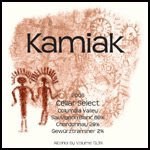 The 2006 Kamiak Cellar Select White Blend was a nice, soft wine made from Sauvignon Blanc, Chardonnay, and Gewurztraminer by Gordon Brothers Winery. I purchased it in a local independent grocery store for $9.99, and it's available from other merchants for $8-$13. There were aromas and flavors of citrus and golden delicious apples, which was not surprising given the grapes that went into this bottle. The wine had a round but fresh mouthfeel, and the wine was accented in the aftertaste but a subtle hint of blood orange. For the price, this is a great contender for your next house white, and represented very good QPR. As proof of this wine's versatility, we had it with a creamy goat cheese and asparagus pasta dish that was healthier than it sounds because no cream is used to make it. Asparagus is a notoriously finicky vegetable when it comes to wine pairing, and sometimes I find Sauvignon Blanc brings out its harsher characteristics. Not so this wine. The Chardonnay and Gewurztraminer provided just enough softness, while the Sauvignon Blanc picked out the green freshness of the vegetables and went well with the goat cheese, too. Yesterday I reviewed an excellent, traditional Sangiovese. If you want to try another bottle, this one priced to cost less than your next takeout pizza, I have one for you. 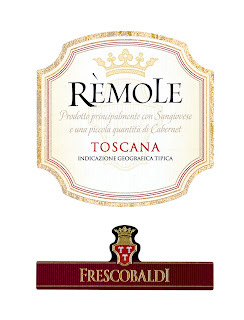 It's the 2007 Marchesi de' Frescobaldi Rèmole Toscana IGT, a Sangiovese with some Cabernet Sauvignon blended into it. (suggested retail $10; this is a new vintage, but previous vintages can be found for $8-$14). It has sour cherry aromas touched with green, peppery notes. These aromas can be found in the flavors, too, and there is a fruity, juicy finish touched with cedar and smoke. I can't think of a wine that would go better with a sausage pizza, or one with mushrooms and green peppers. And for $10, it's a no-brainer. And though very different in style from yesterday's Sangiovese, this one also represents excellent QPR for its affordability and taste. If you're looking for more wine finds that are $10 and under, it's always worth checking out the recommendations made by my friends Taster A and Taster B over at Smells Like Grape. Every Tuesday they highlight their latest $10 wine, so head over there now to see what they're sipping. Sangiovese, like Pinot Noir, is one of those red grapes that I think is just perfect for spring. It's lighter bodied than many reds, and has a bright, fruit-centered core that has lots of acidity and zip. The 2006 Azienda Agricola La Schiaccionaia Trasubie is made with Sangiovese grapes that were grown biodynamically in Tuscany's Montecucco region rather than the better known Chianti. (suggested retail $22; for more information on where you could purchase this wine go to the Domenico Selections website) A bit of Syrah was blended into the wine for added softness. I loved the aromas of leather, sour cherries, and earth that were my introduction to the wine. These were followed up by flavors that were leathery, with nice spicy clove and cherry as well. The wine had a smooth finish, and will please traditionalists who are looking for a wine that is nicely balanced between fruit, acidity, and more complex notes. Even though it cost slightly more than $22, I felt this represented excellent QPR given the quality and the complexity it offered. Sangiovese goes well with grilled meats and pasta dishes, but we had it with a white bean and sausage minestrone that was quick to make and delicious. I added some more crushed tomatoes to the recipe because we had some in the fridge just begging to be used up, and I cut the amount of liquid added to the recipe in half because I like my soup thicker. It worked well--so fiddle with this recipe to get just the consistency and flavor you want. The earthiness of the beans and the fennel in the sausage really brought out the earthy and spicy notes in this wine, and the cherry flavors were an ideal companion to the tomatoes. I've got a shopping list for you over on Serious Grape, my weekly column on Serious Eats. There are whites and reds just perfect for sipping in the garden, firing up the grill, warming yourself up when it rains, and more. And if I've left your favorite spring wine off my list, leave a comment here or in the comments over there. It's spring. If, like me, you have gained ten pounds this winter eating pasta and coconut cupcakes, you might be thinking of switching to something lighter and healthier. If your winter has been unusually hectic (also me), you may be thinking longingly of a massage. I had one last week and highly recommend it! Why not treat yourself to some spa treatment this Friday and try out this fast and healthy recipe. For added pampering, buy an affordable Pinot Noir that pairs perfectly with the dish. The Recipe: Soy-and-Ginger Glazed Salon with Udon is my recommended spa food dish. The flavorful marinade keeps the fish moist and tasty, and then goes on to bathe the noodles and wilted spinach. Salmon is good for you, and as long as you buy sustainably-fished salmon you don't have to feel bad about what you're doing to the species and the environment. I substituted Atlantic Char for the salmon in this dish, because my local Whole Foods was having a special on it, and it worked perfectly. The recipe makes four servings, but its easy to pare it back to serve one, or two. The Wine: Salmon goes well with Pinot Noir, but you want to pick a bottle that is not too ripe. 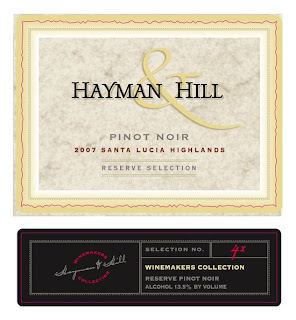 It can be hard to find a wine like this for under $20, but one good bottle to look out for is the very good QPR 2007 Hayman & Hill Pinot Noir Reserve Selection from the Santa Lucia Highlands. (available for $11-$22) This wine had pretty aromas of crushed raspberry and rocks. There was some silkiness of texture (very nice with the salmon and udon), and flavors of high-toned raspberry, pepper, and allspice. You'll find that the raspberry turns blacker and darker and loses some of its high-toned quality with some air, so I'd open this bottle up about 20-30 minutes before you want to eat. Full Disclose: I received this wine as a sample. 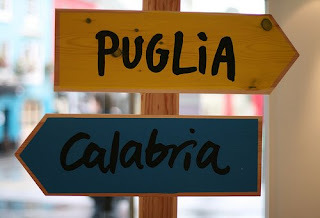 Today I've got the first of my Puglian wines to share with you. 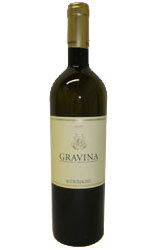 I tried a white wine, the 2005 Botromagno from Gravina. I paid just over $10 for it in a local grocery store, and you can find various vintages for $7-$16. My advice to you is this: buy the youngest wine you can, from the most recent vintage. Why? Well, I don't know much about wine from Puglia but I suspected that this bottle was just a bit over the hill. The wine is made from a blend of Greco and Malvasia grapes, and had faint aromas of almonds, minerals, and lemon all of which were echoed in the flavors. It reminded me a bit of Fino Sherry, and made me wonder if the wine wasn't oxidized just a bit. There was a bitter acidity in the aftertaste, too. As a result it was impossible to assess QPR on this wine. My suspicion is that a 2007 bottling would be fresh, lemony, and lively--and perfect with oysters, which are very popular in Puglia. So I'll have to try to get myself another bottle of this wine and reserve QPR judgement until then. 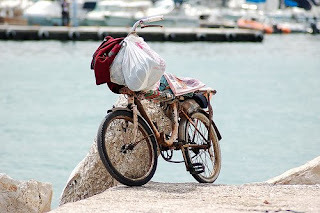 Known in ancient times as Apulia--a name you will still see used for the region today--it's a region that remains largely unknown to outsiders and remains close to its agricultural roots. Olives, almonds, and grapes are some of the crops grown in Puglia. It may be a lesser-known region, but it is a productive one. Puglia makes more wine than any other region in Italy and ties with Sicily for the most grapes grown in Italy. If you've familiar with the wines of Puglia, I hope you leave a note here with recommendations and accounts of your experiences. And if you're new to the region's viticultural bounty (like me) why not look for a wine from Puglia to go with your next pizza or pasta dinner? I've got two red wines (one Primitivo, one a Primitivo/ Negroamaro blend), as well as a white wine to share with you. As always, I'll try to get some regional recipes to go with them but this is usually the thing that falls off my to-do list! 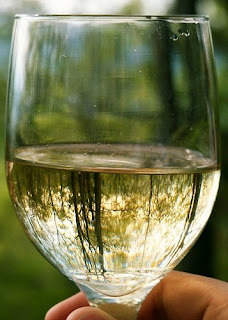 Last week I encouraged everybody to get some zingy Sauvignon Blanc in the house to help you get in the mood for spring. So what about a spring red that's got some zip to go along with it? In spring, I tend to head for reds made with traditional Spanish grapes like Tempranillo and Grenache. To me, they provide a viticultural bridge between the last of the soups/stews/casseroles and the first of the barbecues. Of course, Spanish grape varieties are now grown all over the world. I recently had the 2006 Matchbook Tempranillo from California's Dunnigan Hills AVA (suggested retail $14.99; available for $13-$19). This wine contained mostly Tempranillo with some Petite Sirah (14%) and Graciano (9%). At first opening, the aromas were a bit hot with winey, grapey notes. This sensation blew off fairly quickly--the wine has 13.6% alc/vol, so I'm guessing it was simply a tad warm when I served it--and berry and herbaceous notes came forward. It had a marvelous set of flavors, too: tamari sauce, cherries, and chocolate. This was a flavorful, exceptionally savory wine and represented very good QPR. We had the wine with an Escabèche of Mushrooms served over polenta. This is a vegetarian version of the traditional Spanish dish, which is known for its sharply acidic sauce. It was fantastic with the wine and accentuated the savory qualities of the wine. 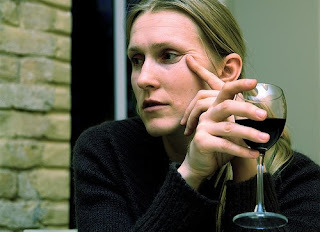 The results of a new study on women and wine are out. For these and other shocking revelations, check out this week's post on Serious Grape, my weekly column on Serious Eats. When will the wine business get it? Women aren't a niche market. We're buying 80% of the wine. If that's a niche, what do we call the other 20% of the people buying wine? The majority? If you've ever wondered what brettanomyces is (and how to spell it), the April wine club pick is for you. 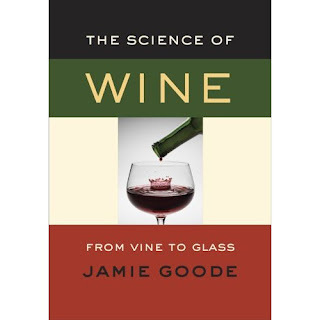 This month, join us as we read Jamie Goode's The Science of Wine: From Vine to Glass. (University of California Press, $35.95; available through amazon.com for $23.73) As many of you know, Jamie Goode is not only a wine author and journalist, he's also a wine blogger. I'm hoping he brings the same lively, lucid style to his book that he exhibits on his blog. Whenever I go to Goode's sight I know I'll get terrific information, delivered with a sense of humor and some down-to-earth common sense. All the reviews for this book praise its clarity and engaging style, so I'm looking forward to finding out more about the science behind the wine I drink. If you'd like to join in, please read the book anytime during the month of April, post a review before Wednesday, April 29 at 5 pm, and send me a link either here or via email to let me know you've done so. That way I'll be sure to include you in the round-up of posts on April 30. Happy April's Fool Day. Today I've got a wine that seems like a joke, but isn't. It's a Malbec from the Loire Valley of all places. When I think Malbec I think of sunny South America, but the grapes for this wine come from one of France's cooler viticultural areas. In France, they call Malbec Côt, and it's been grown in France for centuries. To find out more about Côt, check out these articles on AbleGrape. 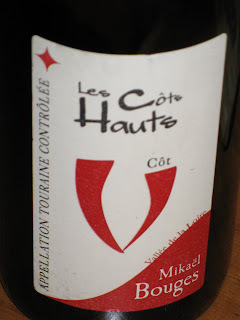 The 2005 Mikael Bouges Les Côts Hauts was deep purple in color and had grapey aromas and flavors. Overall, I found it rustic and a bit thin. I was expecting something green and tannic, but instead all I tasted was blue and purple. I got this wine from Garagiste for $11.83--and I must say that I felt I paid too much for this wine. If it had been around $8, I might have felt differently, but at this price it represented poor QPR. Of course, I bought it for the curiosity value--Malbec from the Loire? If you are interested in tasting a Côt wine, there are plenty available in the market for between $8 and $30. If you take the plunge, let me know how it turns out. I'd love to know if this Côt was typical, or if I should give Côt another try. And if you're looking for some more April Foolery, check out The Dregs Report, a tongue-in-cheek look at the world of wine.